An interesting article on brightlines problems with crossings in populated areas. It seems obvious they should have their own corridor. I've ben hoping to take a ride on this one day soon. You cannot fix STUPID. Over 40 years ago I regularly took the SEPTA commuter train from Bucks County to Philly. The rails were shared with Amtrak. Every year one or two people were killed because they would try to cross the tracks instead of using the pedestrian underpass. The Metroliners were quiet and fast. You cannot fix this problem. Here’s a tongue in cheek suggestion; we require all citizens of southeast Florida who live with two miles either side of the Brightline tracks to begin wearing dog collars capable of delivering a mild electric shock. When a train approaches a crossing or pedestrian crosswalk; an underground electrical wire is activated and anyone attempting to cross will receive a mild shock. Topic title should be changed to “people walk in front of moving train”. I think maybe the gates come down too slowly. Near the end of the article they gave a 40 second time line for an approach. 15 seconds of that bring the gates down. That's long enough for folks to try to cheat and lose the bet. This "news" is a year old. At the time, these trains were very new. Here's a more recent article on the topic. It mixes the personal, various stats, proposed mitigations and other related issues confronting the new line. I hope they get it sorted out and can run the trains north to other population centers. It's on my list to take a ride soon. 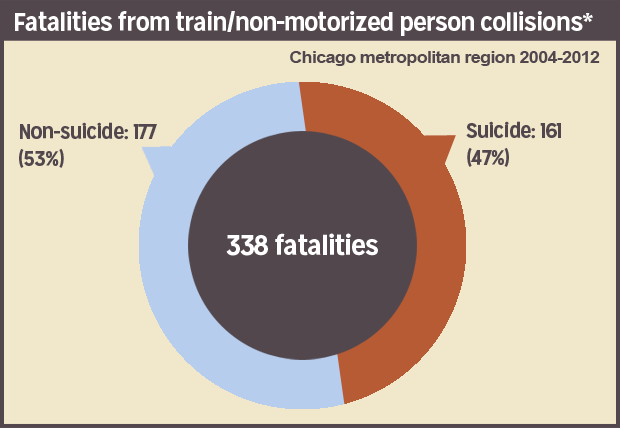 Commuter trains have killed hundreds over the years in Chicago. Many of them were passengers running across the tracks to board the train. So,,,,,,after reading all this, just how has the subject trains been diverting off the tracks in order to "kill people"? As the current news media is proc to report, "The Amtrak train killed the elderly couple at the grade crossing in XXXXXXX!". Never mind the fact that those killed, in fact drove around the lowered warning gates with all the lights & bells activated. Those darned trains are simply killing way to many humans! Well I'm just pointing out overall I think that it still falls to the train organizations to get a safety record that communities can live with. Even if it's because the people ignore the signals, walk on the track and so forth. Look at Disney and the alligators for a similar style issue, just for example. Last year, we took Brightline from Ft. Lauderdale to W. Palm Beach. Nice trains, nice employees, but the ride took 2x the "normal" time to get there. We crawled most of the way for fear of hitting someone. But if you'd just rather take the car and I'm like this myself, if it's easier and faster to take the car even with taking into account half the time there are traffic jams... then the train will fail. No matter how idiot proof you make something, someone will build a better idiot. But if you'd just rather take the car and I'm like this myself, if it's easier and faster to take the car even with taking into account half the time there are traffic jams. Yes. Although you can park your car at a Brightline station garage, you still need a taxi to get where you are going at your destination, unless you work or shop near a station (very unlikely in Ft. Lauderdale, at least). If you are going to Miami Beach, it's a fairly long distance from the station. As far as the planned Orlando destination goes, you will need a rental car or a hotel/theme park pick-up bus. Har, I love that old vid of the riders splitting the field by train. Anyway -- the stations need to go right where people want to go, or most people. After that walking, taxi or subway. Well there's no subway. Finally car rental if you are then going out into the hinterlands. If we built the Great Walls along the RoW of every track in the country, people would climb over them just to get killed. I would think gate down activated spike strips might help at car crossings. Maybe that seems a bit draconian, maybe not. OK, how many people are killed along the same section of I95 each year? Drivers, or pedestrians walking into the traffic lanes? Road deaths are very high 40k about per year in the US overall -- but we tolerate it (note that this exactly anything to proud of). Rail, train and bus don't have nearly so many -- but they also do not have the same level of tolerance for accidents by folks. All total, with breakdown of type. In a way, both. I'm not sure what you're looking for Servern. A way to prevent these deaths? You just can't. Too many people do too many stupid things. A way to keep the RRs out of court? Too many shar---uh, I mean lawyers. A fool-proof preventative? Too many fools. Short of cocooning the entire race in bubbles and not letting them out, this sort of thing will happen. Find a more possible cause to crusade for, like ending poverty or building a bridge from LA to Honolulu. People and vehicles have been hit by trains from almost day 1. The thinning of the herd. The point is for this private venture to succeed, they're going to need community support. Perhaps right now their of idea of running on high(er) speed trains over existing freight track... isn't going to work out for them. Or perhaps they just need a few tweaks to crossings, and folks in these communities only need to adjust their behavior which they learned form the freight trains which are slower. NEWS FLASH: According to today's South Florida Sun Sentinel, Brightline is now called Virgin Trains USA (I'll not comment ). The article reports that new stations are being looked at...the airport, cruise ship port, and for the future Orlando line, Disney World (which would be 20 miles closer). The reporter makes no mention if the airport and seaport stations are in Ft. Lauderdale or Miami (so what else is new?). The new name is a result of the fact that the owner of Virgin Airlines is also a major money source for the train line. It's not the train. The problem in South Florida is just that there are lots and lots of old people there and some of them get dumber and stupider the older they get. Have you ever driven a car around there? Broward and Dade counties have some of the absolute worst drivers in the world. They run red lights, ignore stop signs and obviously, railroad crossings are taken just about as seriously as cracks in the sidewalk. Whenever I'm driving down there I feel like I'm taking my life in my hands. I was in Deerfield last month and was going down a one-way street and had to dodge not one, but two cars going the wrong way! I didn't get a good look at the drivers but my wife told me she saw lots of white hair both times. In no particular order; Aviation (Pilot), Golf, Amateur Astronomy & Cycling (when it's nice out) and Trains (when it's not). I think all this is a big deal really. It's a private venture, and I hope it succeeds. Might be "fun" to own some bonds.